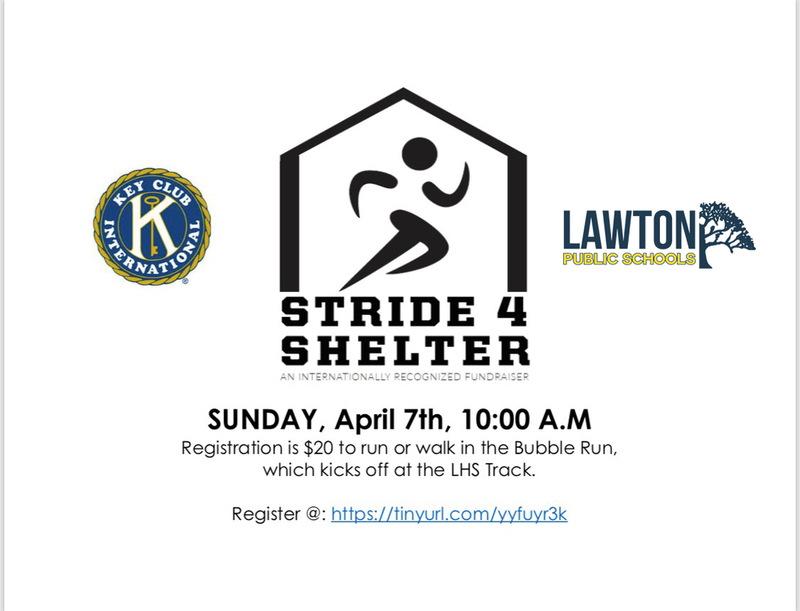 Lawton High School (LHS) Key Club members will host their third annual Stride 4 Shelter Run at 10 a.m. on Sunday, April 7, at the LHS Track. LHS Key Club members made homeless youth in their community the service emphasis in 2015. Stride 4 Shelter is one part of the club's annual fundraising efforts, which also include Trunk-or-Treat for canned food items and Lime-Out LHS for community awareness. All run proceeds benefit the Lawton Public Schools homeless children programs that service more than 800 students in the community that are identified as homeless. Registration for the 5K run/walk/jog is $20. Register online at https://tinyurl.com/yyfuyr3k.